A New Word for 2018... my word found me! Have you heard of choosing a word for your year? Several years ago, there were some well known authors who encouraged the practice. But to tell you the truth, no matter what I chose, it wouldn't "stick." I had to work too hard to remember it and why I even chose it in the first place. Bingo! because actually I didn't choose it. God did! I just received it. And I saw the fullness of my indwelling Christ unfold day by day. (You can read my story right here). So I didn't want to necessarily change it for 2017. But one day early in 2017, God changed it. Or maybe He rather focused that unfolding fullness for me. This is how it happened. At the very end of 2016, we were traveling for the holidays. I woke up in the middle of the night with intense anxiety gripping my soul. All of a sudden the familiar feelings of inadequacy and inability were overwhelming me as the the thoughts of new and old commitments in 2017 came flooding into my mind. I was feeling as if everything had to be done in one day and of course I would fail! The lie again. Oh yes, Jesus, You are always so perfect ... so timely! You are the Bread come down from heaven! You are the Bread of Life! You are my Manna for each day ... no more, no less! Your Fullness will unfold in my life day by day in just the right portion and just the right timing and in just the right way. You are amazing! From (out of) His fullness we have all received, grace upon grace [or bread upon bread]. Now what about 2018? Well, my word found me again this year. In the midst of some long-lasting, deep grief from life circumstances and relationships, my blood pressure shot up again. It had been low and totally good for months and months. But it was in the midst of this broken mess that my word came. I wasn't even looking for it. 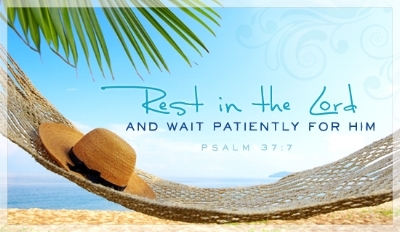 God spoke, "Rest" is your word for the year. But what kind of "rest," Lord? I remembered the past year: my trying so hard (to initiate), my running ahead of the Lord (probably), my agonizing over what I'm not able to change. God is moving me into the rest of deep and persistent prayer, a renewed rest in and abandonment to HIS almighty and timely doing, and yes, maybe even the physical rest of reading and watching my westerns on Me-TV. Dear friends, do you have a word or two that just won't let you go these days? Maybe that's YOUR word for 2018. Ask the Lord about it. Then receive it, journal it, and be amazed by it as I have been by words over the years. And I would love to hear about your word if you would like to share it in the comments below. Gail -- Mine is "believe." Debbie -- I like "rest". Because of certain health issues, God has given me peace about resting more and feeling so blessed. Jenna -- Mine is “firmly planted” from Ps1:1-3. Cherie -- Decided this was my saying or my words and was at Hobby Lobby and there it was. Could not believe it. So, “Let all that you do be done in Love” is my word(s). Stephanie -- A few weeks ago I sensed that it was to be "awe." So, I guess I'll claim it! As I go through Scripture, I am writing down what each passage tells me about God. I figure the more we know of who God is, the more awe we will have in Him. Cindy -- Mine is "unfolding"
Marianne -- I’ve had a word (or two) for the last few years after being challenged by a friend. I’m always a little reluctant to let go of my words at the end of their year. Somehow God always sends me a new one that pushes me forward. This year I’m leaning toward “pursue “ but still waiting on confirmation. Karen -- I love this practice. 💝 This year I'm holding my word inside until I've lived into it for a while. LeighAnn -- I think my word might be "Listen". I need to listen more to God and to my loved ones - with eye contact.